It’s not just New York. Just about anywhere you have a storage siding, you’ll get tagging. I’ve seen some fairly well known examples roll through my little podunk corner of the world. True some of the freight train rolling stocks are covered with graffiti. In fact there is no fence protecting the transfer yards near my house. I do like that custom and how Thomas looks. The creator did a fine decaling job. 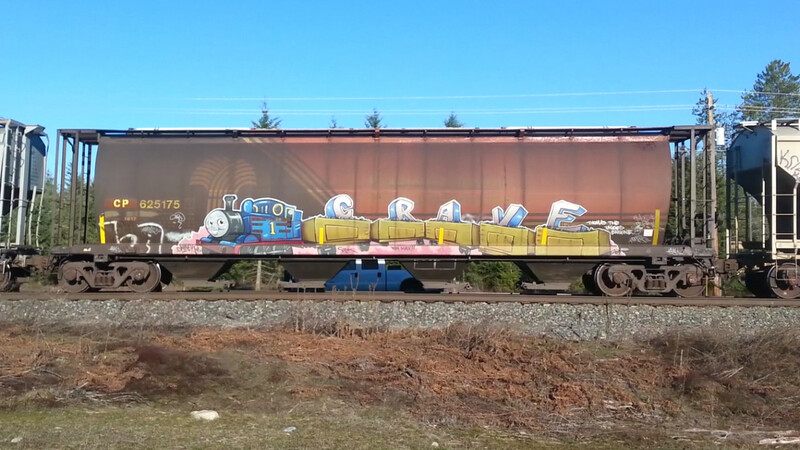 Speaking of Thomas graffiti... I saw this on the highway while driving into town (pop. 650) a few years ago. That’s a pretty impressive piece of artwork on that grain hopper! It was “nice” of him to at least leave the data plates clear. I’ve got to admit it would be amusing to see some Thomas themed tags on a train being pulled by Thomas! I’m of two courses of thought on this. I see some very interesting, elaborate artwork on some of these. On the other hand, this traveling mural belongs to someone else who probably didn’t authorize the artwork. interesting. this rolling stock belongs to Canadian Pacific I think. Security around rail yards must be very lax. It will take many hours to complete this mural. Does that say 'Grave' or 'Crave'? (04-11-2019, 11:29 AM)leylandvictory2 Wrote: interesting. this rolling stock belongs to Canadian Pacific I think. Security around rail yards must be very lax. It will take many hours to complete this mural. More than likely, the mural was painted while this was in a storage siding somewhere in Podunk. Security around major rail facilities is pretty tight, at least in the US. Some smaller and/or older yards are pretty accessible though. But many cars are stored on unused branch lines and sidings or leased space on short lines, sometimes for months or even years. It gives the taggers and mural artists plenty of time to work unobserved. This particular car is a grain hopper, so I imagine it gets used seasonally and is left stored in the off season. (04-11-2019, 11:34 AM)Super Wrote: Does that say 'Grave' or 'Crave'? I’m gonna say “Crave”. I had to enlarge the image and study it for a bit because I couldn’t tell either. Advertisement for a young gang of children called Crave who spend there days eating chocolate bars they like and getting a sugar rush. its probably just the artists "handle", much like ours on here. they use it as a way of marking their territory. That makes sense Sun...Does your motorcycle gang have a 'handle' to mark the territory? When it comes to graffiti Thomas stuff don't forget there's a whole range of them in the Thomas Mini line, I'm amazed nobody brought them up already, there are some really nice ones in there. Would be nice to see some of our more artistic members translate those onto real size plarail Thomas range models (now there's a challenge for you modders out there) after all we all got spare samples of Thomas, some it a tatty state anyway that wouldn't suffer from a graffiti paint job to cover the defects. Now there's an idea, a 'competition' thread for custom graffiti Thomas Plarail models!! yes use vinyal wrap to wrap the tomy trains we have. Pretty sure all of us has over 10+ Thomas sitting in our houses ready for destruction or harvest for parts.